Today’s government agencies, both at home and abroad, are beset by increasingly complex challenges within a more interconnected and ever-shifting political landscape. The technology solutions that ultimately help overcome these challenges must harness the power of data connections. Governments around the world already use graph technology to fight crime, prevent terrorism, improve fiscal responsibility and provide transparency to their citizenry. Often these solutions involve connecting data across different applications or repositories, spanning disparate processes and departments. 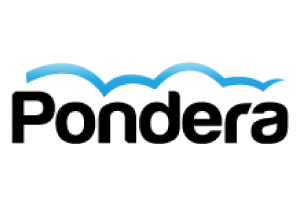 To quickly make sense of obscured, divergent data, a graph database platform that’s flexible, scalable and powerful is required. A graph database platform reveals data connectedness to achieve your agency’s mission-critical objectives – and so much more. Using real-world government use cases, Graphs in Government: Fulfilling Your Mission with Neo4j explains how graphs solve a broad range of problems that can’t be solved in any other way. Learn how Neo4j modernizes the U.S. Army's core procurement, budgeting and logistics processes. Discover how graphs are empowering government in federal agencies and in the public sector. Learn about the power of transforming data into knowledge with Neo4j. Find out how graph technology is enabling law enforcement agencies to analyze connected data at scale. 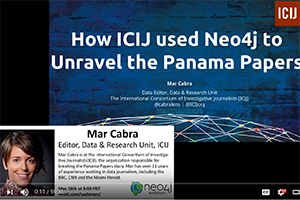 Discover how the International Consortium of Investigative Journalists (ICIJ) used Neo4j and Linkurious to unlock connections within the Panama Papers data. 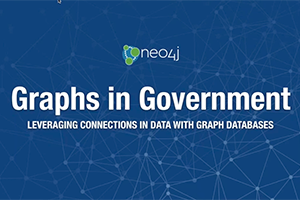 Watch an overview of Neo4j and and discover how a connected approach towards data applies for different use cases within Government, such as e-government, security, health care, law enforcement, and treasury. 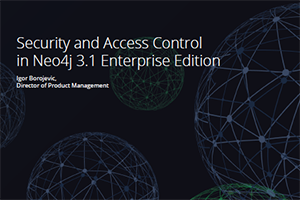 Look closely into Neo4j’s enterprise-grade security architecture raising the bar for safeguarding your data while meeting compliance requirements. Intelligence-gathering agencies in the U.S., Europe and the Middle East are using graph technology to reveal how affiliations, accounts, technology, activities and travel are intertwined to uncover suspicious behaviors. Transparency in local government has recently become a cultural imperative across the globe. Progressive governments are turning to graph data models to link government services with existing communities, to project and evolve city planning initiatives, and to improve the lifestyles of their citizenry, without increasing current tax revenues. Tax collection agencies are using graph technology to more accurately identify candidates for audit or inspection. A very public example of this is the “Panama Papers” investigation led by the International Consortium of Investigative Journalists (ICIJ) which revealed widespread use of offshore accounts owned by shell corporations used to hide sizeable amounts of taxable income from governments worldwide. Regulation and compliance agencies use graphs to measure and enforce regulations across the business and social sectors, including GDPR and Sarbanes-Oxley (SOX) Act. Social service programs are optimizing their payout and fighting fraudulent activities by improving service transparency using the graph data model. Military branches from several nations have adopted graph database technology to improve in-theater supply chain efficiency and resource delivery as well as to better understand local communities, customs and traditions during deployments. Science and exploration agencies are using graph databases to maintain the institutional memory bank of their research. For example, NASA’s knowledge graph has already shaved two years off the Orion (mission to Mars) planning schedule because the agency was able to quickly retrieve lessons learned from their online graph archive. Graph technology essential for rooting out tax evasion efforts – often hidden beneath complex and obscured layers of offshore shell companies – whether at home or abroad. Improved social services and program transparency lead to a more engaged and informed citizenry at all levels of federal, regional and local government. Graph-based tools are foundational in modern fraud detection, terrorism prevention and anti-money laundering (AML) activities. No database technology handles complex queries as efficiently and fast as a native graph database – and in sensitive intelligence or military scenarios, every millisecond makes a difference between victory or failure. No batch processing when querying real-time transaction data. Neo4j easily ingests and processes connections from multiple data sources, solving problems with data stored in disparate silos across – or within – government agencies. Unlike relational databases, Neo4j stores interconnected user and purchase data that is neither purely linear nor hierarchical. Neo4j’s native graph storage architecture makes it easier to decipher citizen or intelligence data by not forcing intermediate indexing at every turn. Neo4j’s versatile property graph model makes it easier for government agencies to evolve real-time solutions – whether military, financial or scientific – as data types and sources change. Neo4j’s native graph processing engine supports high-performance graph queries on large user datasets to enable real-time decision making at every level of government. The built-in, high-availability features of Neo4j ensure user data is always available to your mission-critical applications. Your government organization is driven by connections – now it’s time for your database to do the same. Click below to download and dive into Neo4j for yourself – or read the white paper to learn how graph databases discover connections in today’s most cutting-edge fraud detection solutions.